With the 2013 season underway, the cross country team added new members to their family to add to their success. For the first time, middle schoolers have been able to be a part of the team. With the three middle school runners and 18 high schoolers, the team has doubled in size in the last two years. Q: What’s it like being on a team with your brother? A: It’s actually pretty fun having my brother push me so we can both get better. Q: What are your individual goals for the season? 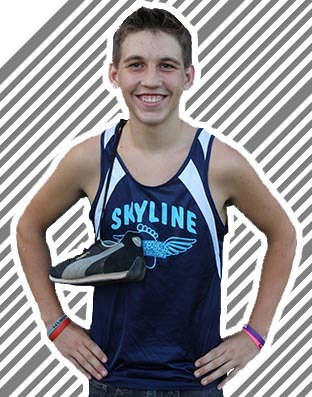 A: My goal for the season is to run hard and make it to State. Q: Who do you look up to the most? A: Brooke, she’s like my big sister and she always pushes me to do my best. Q: What’s it like being on a team that is so closely bonded? A: It’s nice being on a team where we all think of each other as a family. It’s like we all help each other get through our hard times, and run as a family, not as individuals. With four returning seniors, expectations for the season are high. Head coach Lynette Freeman said she expects the same things as last year. She has high hopes of taking both a boys’ and girls’ team to State. “My individual goal is to be 2A State Champion, and my goal for the team is to have both the boys’ and girls’ teams win League,” Fisher said. The team is a close-bonded family with blood ties adding to that. Eight members are siblings. The Giles, Corbets, Ghumms and Ibarras get the opportunity to support each other as teammates, as well as siblings. As in all families, there is also tension, but that hasn’t caused issues between runners. “It’s not as fun being on a team with my brother because he’s pretty fast and there’s a lot of competition,” sophomore Miranda Ghumm said. The results so far please Freeman, as well as the way the team is working together. At the first meet, the boys’ team took second place and the girls took fourth. At the home meet on Sept. 12, the boys took first and the girls took fourth once again. The next meet is on Oct. 3 at Pratt. Great first story Kaitlyn. Thanks for fixing the date of the next meet.